Willie Larkin, an outraged motorist, wants to sue the Partridge family for whiplash. - Harry Morgan is best known for his roles on "Dragnet" and "M*A*S*H." He also appeared as Cal Courtney in Episode 48. - Farrah Fawcett is best remembered for her role in "Charlie's Angels." "When We're Singing" becomes the theme song for the series' first season. It's replaced in Season two with "C'mon Get Happy." I love this episode. It filmed entirely on the Ranch, including the park area (across from the PF house and pool) that would show up over and over again -- including in "Danny and the Mob" among others. The home facade used for Willie's home is one of the oldest facades on the Ranch, and one of the few that still remain from the original Columbia/Screen Gem days. 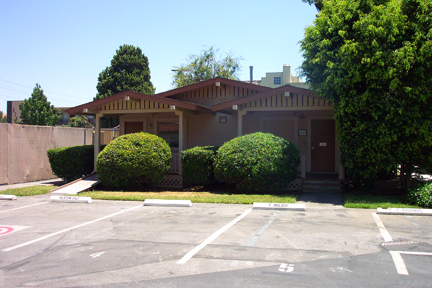 It's close to the original entrance (now closed), on the corner of Hollywood Way and Oak Streets in Burbank. 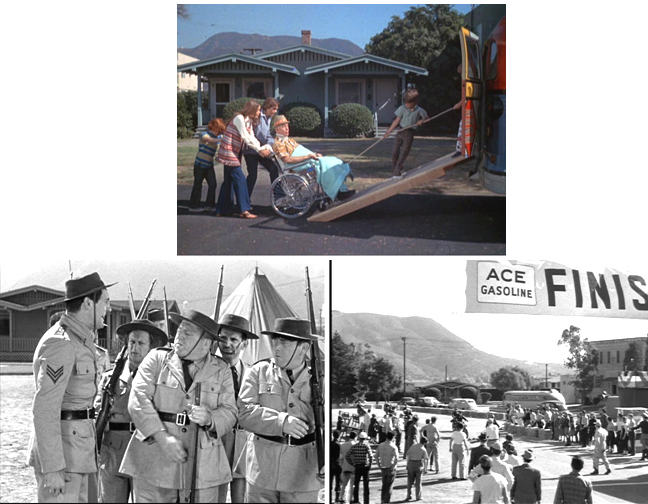 Directly to the left (facing) of Willie's home is the gas station used in "Guess Who's Coming To Drive?" and to the right is the civic building, used in various PF episodes as a school. If you look closely during this episode, when Reuben and Danny are parked outside his home, trying to catch Willie walking around unhurt, you will see the side of the civic building.) The civic building was torn down a while ago, and homes put in it's place, and used in such films as "National Lampoon's Christmas Vacation" with Chevy Chase and "Lethal Weapon" with Mel Gibson and Danny Glover. It's the "Lethal Weapon" brick home (where Danny Glover's character lived) that was blown up in the film -- not the PF house. (Remember when Danny Glover was sitting on the toilet?? ) Across the street from Willie's home is where the Taco Stand was situated -- although that wasn't a permanent Taco Stand structure. They would actually re-dress a second gas station to look like the Taco Stand for various episodes, such as "Whatever Happened To Keith Partridge?" Wow, what fantastic info, Scott! It's going to help me enjoy the episode much more knowing all of this (it's not one of my favorite episodes). I hope to watch it after the Golden Globes, but I may not be able to post my thoughts until after work tomorrow. I seriously can't wait to watch it now, with all of this history to consider! You rock, Scott!!! Hey Scott! thanks for the info and the pics, love seeing currrent pics of scenes from Partridge Family epiosde, can't wait until we get to the skunk episode to see if maybe a pic will be included of the motel the family was out side of when the cops showed. This is one of my faves from the first season cause I love seeing a very young Farrah Fawcett in this episode. I was a huge Charlie's Angels fan also, so the three episodes with Farrah, Jacklyn and Cheryl are fun to watch.... Thands again Scott. I like this episode alot. I have a soft spot in my heart for Harry Morgan ever since he joined MASH. The chance to see him with our favorite TV family was nice. The way the song was incorporated into the show was a great touch as well. Though I never tire of seeing the family in performance mode, to use the song more organically to move forward the feeling of the show worked very well. And do you remember when moral and ethical cause and effect actually made for the plots of situation comedies, rather than just a convenient place to hang a few gags? Shirley deciding to fight because the kids need to see her set an example gave the right feel for a family show. The comic antics of Harry Morgan's faking his injury and Danny and Rueben's attempts to trick him into revealing it gave us some terrific repartee. It's true, how someone has mentioned that to start with Keith really didn't have as much to do as Danny, but I hadn't noticed it before. Still Mr. Cassidy took what was handed him and as more and more attention came his way, handled it so well. Not quite the same impact as the first episode, but a strong one just the same. And I love the song! One of my favorites. The first of two (I believe) great Martin Ragaway-penned episodes (the other being "In 25 Words or Less"). I, too, loved Harry "Col. Potter" Morgan here as the curmudgeonly "Whiplash Willie" Larkin. BTW, one of the terrific things about these early eps. is the way all of the characters are utilized in the story. I'm referring to Chris and Tracy specifically, who seem to be a little more prominent than they would be in later seasons (Chris' extortion attempt over a supposed skinned knee was naughty, but cute). And, needless to say, Danny and Reuben are priceless in their failed efforts to entrap the wiley Willie. The dialogue in this one is really good. It pains to to remember how some of it was used (or misused, actually) in DB's awful PF movie. I also enjoyed the "I'll Leave Myself a Little Time" sequence. I recall this part of the ep. being foolishly cut out of the syndicated version that aired on NYC's Ch. 5 in the late 70s. Being able to watch these shows unedited is one of the many wonderful things about DVD. I couldn't agree more, you guys! I always wind up enjoying this particular episode more than I previously recall for some reason. The early antics of Danny and Reuben, and what turned out to be 'The $80 Comedy Of Errors' is priceless! But I also loved that Shirley actually used the whole unpleasant experience to teach/remind her kids the value of doing the right thing -- even/especially when it's inconvenient. I'd also like to add my thank you to Scott for the info and pictures. This episode isn't one of my favorites, but one of the thing's I do like about it is that the ranch is shown quite a bit, and I appreciate the behind the scenes tour so to speak. I love the song I'll Leave Myself A Little Time. Hearing it with just the basic bed tracks, is cool, as is getting to hear the background vocals more. And as goodyj said, the way the song was staged in the episode is cool, non stage performance shot's, then blending the ending into the family practicing in Willie's living room, I just really like it. I like Harry Morgan as an actor, and both he and the family have some great lines. I consider it a strong second episode for the show. But I like other episodes better. More useless trivia: Harry Morgan's son, Christopher, was an assistant director on "The Partridge Family." Was he AD the entire run of the show? I think so -- you'd have to check out the closing credits. I am pretty sure he's listed there. According to David, Christoper Morgan was a great jokester, which lead David to believe the phone call from Elvis was a hoax! This episode was not one of my favorites but it features one of my favorite songs. I remember watching this episode when it originally aired with my brothers and sisters, we all laughed so hard at Danny and Reuben's antics. Boy, what chemistry they had. Thanks Scott for the interesting background on this episode. I love hearing the first season theme song! I never liked the later theme as much. I also love the closing credits music! I used to play "air harpsichord" frantically on the arm of our sofa when it was on! I usually played so furiously, I ended up throwing myself off the sofa onto the floor by the time it was over. Gad, I was a maroon! I can't believe they let Farrah Fawcett go braless! I can't believe I didn't have that seered into my brain when I was eight years old! And wow, that miniskirt was mini! I like this episode much more today than I did when I was a boy! I wonder where they found that tiger-striped smoking jacket! Wow! That's one ugly piece of clothing! I can't believe Rueben didn't ask for it as part of their out-of-court settlement! I don't remember Rueben ever being that skinny! BTW, I just got word from amazon.com that they're shipping my latest order WITHOUT his book! I guess they're out of stock, but they said it's coming. Did anyone else have that problem? I'm probably going to keep track of Simone sightings during our DVD club meetings. There she is sitting in Willie's lap during their performance of I'll Leave Myself A Little Time. Ah, Simone! The only Partridge with fewer lines than Chris and Tracy! My husband watched this one with me tonight. He of course, recognized Harry Morgan. and Farrah. She really was a dumb blonde in this one. I actually found the moral of this story relevant today, since a few years ago I ended up letting the insurance company settle for money to total my car out rather than making them fix it. Filming and airing of the episodes though definitely had to be differetn since "I'll leave Myself a Little time" is on UpTo Date which is the second album and the first one was barely out at the start of the season.